Audi continues its tradition of revealing plug-in hybrid concepts at the various auto show around the globe. 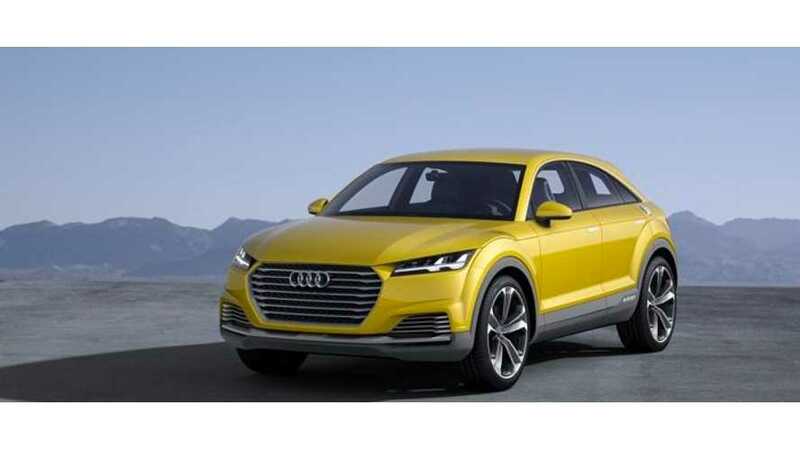 This latest one, called the Audi TT Offroad concept, was revealed last month at the 2014 Beijing Auto Show. Audi has shown several TT-ish plug-in concepts, but this latest one combines the sportiness of the TT with some attributes typically found on an SUV. This isn't the first time Audi has employed inductive charging and likely won't be the last. For some reason, Audi likes the inductive charging option. The Audi TT Offroad concept features two electric motors and a 2.0 TFSI engine. Total HP is listed at 408. 0 to 60 MPH is lsted at 5.2 seconds and top speed is 155 MPH. According to Audi, the TT Offroad Concept will return 123.8 US MPG. We don't believe that the TT Offroad concept will go into production. The Audi TT offroad concept breaks the mold, combining the sportiness of a coupe with the lifestyle and utility of a compact SUV. The four-door model, which Audi is presenting at the Beijing International Automobile Exhibition, adds an entirely new expression to the Audi design language. Its plug-in hybrid drive with two electric motors and a system output of 300 kW (408 hp) provides for dynamic performance, yet consumes on average just 1.9 liters of fuel per 100 kilometers (123.8 US mpg). *The collective fuel consumption of all models named above and available on the German market can be found in the list provided at the end of this MediaInfo. The plug-in hybrid drive The plug‑in hybrid drive in the Audi TT offroad concept delivers 300 kW (408 hp) of system output and 650 Nm (479.2 lb‑ft) of system torque. The show car accelerates from 0 to 100 km/h (62.1 mph) in 5.2 seconds and reaches the electronically governed top speed of 250 km/h (155.3 mph) without any trouble. It consumes just 1.9 liters of fuel per 100 kilometers (123.8 US mpg), a CO2 equivalent of 45 grams per kilometer (72.4 g/mile). Chassis The Audi TT offroad concept shows its strong character on any road surface and in any terrain. On asphalt the show car is sporty and composed, and it can easily handle light terrain thanks to its high ground clearance, short overhangs and e‑tron quattro all-wheel drive. 255/40-series tires are mounted on 21‑inch wheels, whose delicate five-arm design draws on the look of the Audi e‑tron models. Dark trim provides contrast. Driver assistance systems The Audi TT offroad concept show car features two Audi driver assistance systems that are almost ready for production: the intersection assistant and online traffic light information technology. The intersection assistant aims to help to avoid side-impact collisions, or reduce their severity, where lanes merge and at intersections. Radar sensors and a wide-angle video camera scan zones to the front and sides of the car. If the system detects a vehicle approaching from the side and assesses it to be critical, graduated warnings are displayed in the Audi virtual cockpit. Body Like many of the brand's new production models, the Audi TT offroad concept is also based on the versatile modular transverse matrix (MQB). The body of the show car is based on the ASF (Audi Space Frame) principle and features a hybrid concept with both steel and aluminum components. Together with the battery package of the plug-in hybrid drive system, it gives the compact crossover a low center of gravity, which is a prerequisite for its sporty performance. 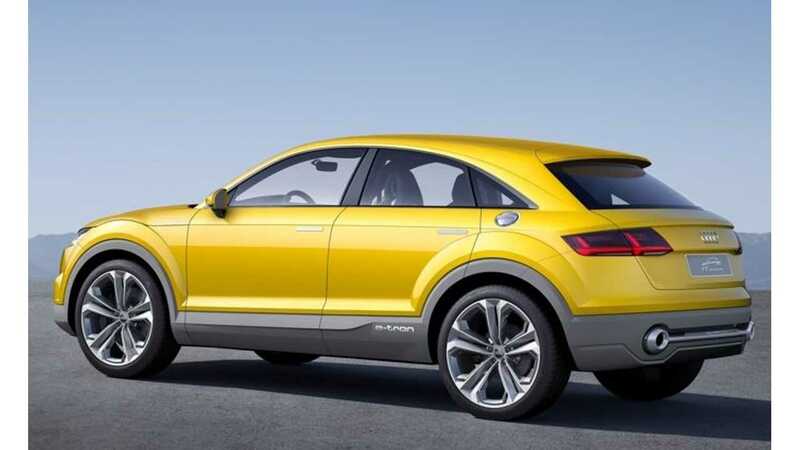 Exterior design 4.39 meters (16.2 ft) long, 1.85 meters (6.1 ft) wide and a wheelbase of 2.63 meters (8.6 ft) – in these dimensions the Audi TT offroad concept resembles today's compact SUV, the Audi Q3*. At 1.53 meters (5.0 ft) tall, however, it is 8 centimeters (3.2 in) shorter, making its sporty character obvious at first glance. The Sonora Yellow outer skin appears to have been modeled from a solid block; the interplay of the clearly drawn lines and the muscularly taut surfaces produces a highly dramatic design. It uses the design language of the Audi TT*, but places its elements in a new context. Interior The interior of the Audi TT offroad concept offers space for four. The rear seat can accommodate two adults comfortably. The slim sport seats with integrated head restraints ensure lateral hold. The side bolsters of the front seats are very strongly contoured.